Joe Keery plays Steve Harrington on Stranger Things and had he not had to walk his mother to her car, I never would have gotten this picture. As you can see, he may or may not have been quite inebriated. All I know is that he wouldn't come over for the screaming fans, so we had to go to him. 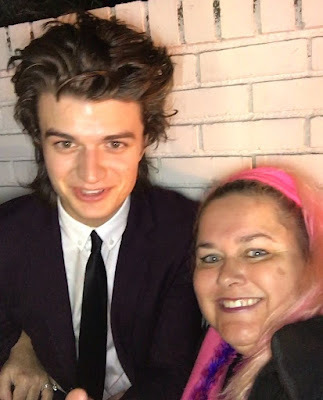 Strangely, the cast of Stranger Things is not nice anymore, so I was more than happy to meet him when I did.